Is almost every woman you meet in Nigeria wearing a wig? Yes, if you believe recent reporting by many of the country’s reputable publications. This was for fashion purposes, many said , with the convenience of wigs and their ability to transform a person’s look “in seconds” said to be behind the trend. But is the eye-raising statistic accurate? The reports all cited a study by the News Agency of Nigeria , the country’s largest public newswire. The survey of 1,100 women aged 18 to 35 found that “no fewer than eight out of 10 Nigerian women” wore wigs daily. According to the reports, the survey found that 81.8% of respondents owned wigs and preferred them to sew-in weaves. Those who did not wear wigs ( 18.2% ) said they were heavy. Some 54.5% owned one to three wigs and 45.5% owned six or more, so they could wear different wigs on different days. Africa Check contacted Anita Eboigbe, the agency reporter who conducted the survey. She said the research was done in December 2018 and January 2019. This was as part of a larger topic “a friend” was working on, Eboigbe said. “Nigerian ladies and wigs (which is the focus of my study) was more or less a subset of what my colleague was working on.” Eboigbe did not give details on how the survey was structured. But she did say she had “focused on working-class women in the three states”. But the survey as reported could not apply to all of Nigeria, statisticians told Africa Check. The study should have considered at least two or three states in each of Nigeria’s six geopolitical zones, said Tunde Akinoladokun, a retired statistician. Prof Abayomi Adebayo, a former dean of economics at the Obafemi Awolowo University agreed the sample used should have been more widespread. The study should also have considered income levels in other states, Adebayo added. To generalise the result, the researcher would have needed to interview women across states, ages, income brackets and other key criteria, said Emmanuella Akarawak, a data analyst at the University of Lagos. Eboigbe said the headlines did not reflect the findings of the survey, which was still ongoing. 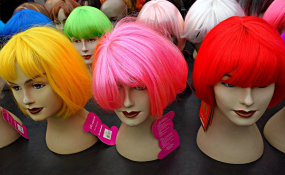 Conclusion: Data doesn’t support claim that eight in 10 Nigerian women wear wigs daily. A survey widely reported in the media claimed 81.8% of women in Nigeria wore wigs daily. Some 1,100 women aged 18 to 35 in Lagos, Abuja and Port Harcourt were interviewed. But experts said survey results from only working class women in the three cities couldn’t be said to apply to all the women in Nigeria. An expert said the researcher would have had to interview women across states, ages, income brackets and other key criteria to get a broader result. We therefore rate the claim as reported in the media as misleading.